Add a dose of style to your wardrobe collection with this skirt from Purys. It features an animal print pattern, which will add an extra dose of style to your look. Besides, it is tailored with premium quality polyester fabric, which will provide you with maximum comfort for a long time. 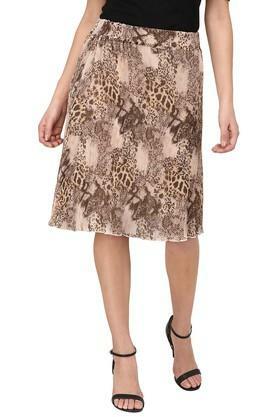 Designed for all the fashion conscious women of today, this skirt will be an ideal pick for casual occasions. You can combine it with a top and a pair of ballerinas to complete your look.